Text: Kean’s range of expression, as already hinted, was very limited. His physical aptitudes were such as conﬁned him to the strictly tragic passions and for these he was magniﬁcently endowed. Small and insigniﬁcant in ﬁgure, he could; at times become impressively commanding by the lion-like power and grace of his bearing. I remember, the last time I saw him play Othello, how puny he appeared beside Macready, until in the third act, when roused by Iago’s taunts and insinuations, he moved towards him with a gouty hobble, seized him by the throat, and, in a well-known explosion, “Villain! be sure you prove,” &c., seemed to swell into a stature which made Macready appear small. On that very evening, when gout made it difﬁcult for him to display his accustomed grace, when a drunken hoarseness had ruined the once matchless voice, such was the irresistible pathos—manly, not tearful—which vibrated in his tones and expressed itself in look and gestures, that old men leaned their heads upon their arms and fairly sobbed. It was, one must confess, a patchy performance considered as a whole; some parts were miserably tricky, others misconceived, others gabbled over in haste to reach the “points”; but it was irradiated with such ﬂashes that I would again risk broken ribs for the chance of a good place in the pit to see anything like it. Comments: George Henry Lewes (1817-1878) was an English literary critic and philosopher, best-known now as the partner of the author George Eliot (Mary Ann Evans). The ailing Edmund Kean, reaching the end of his career and his life, and William Macready disliked one another. Kean had previously avoided acting opposite his younger rival. Macready complained at how Kean upstaged him by taking up unfair positions on the stage. Kean died just a few months later, on 15 May 1833. Text: May 8.—Mr. McCready commenced an engagement last evening at the Opera-House, Astor place, and was to have performed the part of “Macbeth,” whilst his rival Mr. Forrest, appeared in the same part at the Broadway theatre. A violent animosity has existed on the part of the latter theatrical hero against his rival, growing out of some differences in England; but with no cause, that I can discover, except that one is a gentleman, and the other is a vulgar, arrogant loafer, with a pack of kindred rowdies at his heels. Of these retainers a regularly organized force was employed to raise a riot at the Opera-House and drive Mr. McCready off the stage, in which, to the disgrace of the city, the ruffians succeeded. On the appearance of the “Thane of Cawdor,” he was saluted with a shower of missiles, rotten eggs, and other unsavoury objects, with shouts and yells of the most abusive epithets. In the midst of this disgraceful riot the performance was suspended, the respectable part of the audience dispersed, and the vile band of Forresters were left in possession of the house. This cannot end here; the respectable part of our citizens will never consent to be put down by a mob raised to serve the purpose of such a fellow as Forrest. Recriminations will be resorted to, and a series of riots will have possession of the theatres of the opposing parties. May 10. — The riot at the Opera-House on Monday night was children’s play compared with the disgraceful scenes which were enacted in our part of this devoted city this evening, and the melancholy loss of life to which the outrageous proceedings of the mob naturally led. An appeal to Mr. McCready had been made by many highly respectable citizens, and published in the papers, inviting him to finish his engagement at the Opera-House, with an implied pledge that they would stand by him against the ferocious mob of Mr. Forrest’s friends, who had determined that McCready should not be allowed to play, whilst at the same time their oracle was strutting, unmolested, his “ hour upon the stage” of the Broadway theatre. This announcement served as a firebrand in the mass of combustibles left smouldering from the riot of the former occasion. The Forresters perceived that their previous triumph was incomplete, and a new conspiracy was formed to accomplish effectually their nefarious designs. Inflammatory notices were posted in the upper ward, meetings were regularly organized, and bands of ruffians, gratuitously supplied with tickets by richer rascals, were sent to take possession of the theatre. The police, however, were beforehand with them, and a large body of their force was posted in different parts of the house. When Mr. McCready appeared he was assailed in the same manner as on the former occasion; but he continued on the stage and performed his part with firmness, amidst the yells and hisses of the mob. The strength of the police, and their good conduct, as well as that of the Mayor, Recorder, and other public functionaries, succeeded in preventing any serious injury to the property within doors, and many arrests were made; but the war raged with frightful violence in the adjacent streets. The mob — a dreadful one in numbers and ferocity—assailed the extension of the building, broke in the windows, and demolished some of the doors. I walked up to the corner of Astor place, but was glad to make my escape. On my way down, opposite the New York Hotel, I met a detachment of troops, consisting of about sixty cavalry and three hundred infantry, fine-looking fellows, well armed, who marched steadily to the field of action. Another detachment went by the way of Lafayette place. On their arrival they were assailed by the mob, pelted with stones and brickbats, and several were carried off severely wounded. Under this provocation, with the sanction of the civil authorities, orders were given to fire. Three or four volleys were discharged; about twenty persons were killed and a large number wounded. It is to be lamented that in the number were several innocent persons, as is always the case in such affairs. A large proportion of the mob being lookers-on, who, putting no faith in the declaration of the magistrates that the fatal order was about to be given, refused to retire, and shared the fate of the rioters. What is to be the issue of this unhappy affair cannot be surmised; the end is not yet. May 12. — Last night passed off tolerably quietly, owing to the measures taken by the magistrates and police. But it is consolatory to know that law and order have thus far prevailed. The city authorities have acted nobly. The whole military force was under arms all night, and a detachment of United States troops was also held in reserve. All the approaches to the Opera-House were strictly guarded, and no transit permitted. The police force, with the addition of a thousand special constables, were employed in every post of danger; and although the lesson has been dearly bought, it is of great value, inasmuch as the fact has been established that law and order can be maintained under a Republican form of government. Comments: Philip Hone (1780-1851) was an American businessman and diarist, who was Mayor of New York 1825-1826. The cause of the riot at the Astor Place Opera House on 10 May 1849 was the rivalry between the American actor Edwin Forrest and the British actor William Charles Macready, which was blown up by the press during Macready’s 1848-40 tour of the United States, cast in Britain vs. America terms. A performance of Macready’s Macbeth at the Astor Place in New York on 7 May 1849 was halted after rioting in the theatre. On 10 May another performance was interrupted by rioting among rival supporters of the two actors which spilled out into the streets. The New York State Militia was called, and at least twenty-two people were shot dead, with dozens more injured. Text: A Mr. Macready appeared at Covent Garden Theatre on Monday and Friday, in the character of Orestes in the Distressed Mother, a bad play for the display of his powers, in which, however, he succeeded in making a decidedly favourable impression upon the audience. His voice is powerful in the highest degree, and at the same time possesses great harmony and modulation. His face is not equally calculated for the stage. He declaims better than anybody we have lately heard. He is accused of being violent, and of wanting pathos. Neither of these objections is true. His manner of delivering the first speeches in this play was admirable, and the want of increasing interest afterwards was the fault of the author rather than the actor. The fine suppressed tone in which he assented to Pyrrhus’s command to convey the message to Hermione was a test of his variety of power, and brought down repeated acclamations from the house. We do not lay much stress on his mad scene, though that was very good in its kind, for mad scenes do not occur very often, and, when they do, had in general better be omitted. We have not the slightest hesitation in saying that Mr. Macready is by far the best tragic actor that has come out in our remembrance, with the exception of Mr. Kean. We, however, heartily wish him well out of this character of Orestes. It is a kind of forlorn hope in tragedy. There is nothing to be made of it on the English stage beyond experiment. It is a trial, not a triumph. These French plays puzzle an English audience exceedingly. They cannot attend to the actor, for the difficulty they have in understanding the author. We think it wrong in any actor of great merit (which we hold Mr. Macready to be) to come out in an ambiguous character, to salve his reputation. An actor is like a man who throws himself from the top of a steeple by a rope. He should choose the highest steeple he can find, that, if he does not succeed in coming safe to the ground, he may break his neck at once, and so put himself and the spectators out of farther pain. Ambrose Phillips’s Distressed Mother is a very good translation from Racine’s Andromache. It is an alternation of topics, of pros and cons, on the casuistry of domestic and state affairs, and produced a great effect of ennui on the audience. When you hear one of the speeches in these rhetorical tragedies, you know as well what will be the answer to it, as when you see the tide coming up the river – you know that it will return again. The other actors filled their parts with successful mediocrity. We highly disapprove of the dresses worn on this occasion, and supposed to be the exact Greek costume. We do not know that the Greek heroes were dressed like women, or wore their long hair straight down their backs. Or even supposing that they did, this is not generally known or understood by the audience; and though the preservation of the ancient costume is a good thing, it is of more importance not to shock our present prejudices. The managers of Covent Garden are not the Society of Antiquaries. The attention to costume is only necessary to preserve probability; in the present instance, it could only violate it, because there is nothing to lead the public opinion to expect such an exhibition. We know how the Turks are dressed, from seeing them in the streets; we know the costume of the Greek statues, from seeing casts in the shop windows; we know that savages go naked, from reading voyages and travels; but we do not know that the Grecian chiefs at the Siege of Troy were dressed as Mr. Charles Kemble, Mr. Abbott, and Mr. Macready were the other evening in the Distressed Mother. It is a discovery of the managers, and they should have kept their secret to themselves. The epithet in Homer, applied to the Grecian warriors, kάρη kομόωντες, is not any proof. It signifies, not long-haired, but literally bushy-headed, which would come nearer to the common Brutus head than this long dangling slip of hair. The oldest and most authentic models we have are the Elgin Marbles, and it is certain the Theseus is a crop. One would think this standard might satisfy the Committee of Managers in point of classical antiquity. But no such thing. They are much deeper in Greek costume and the history of the fabulous ages, than those old-fashioned fellows, the Sculptors who lived in the time of Pericles. But we have said quite enough on this point. Comments: William Hazlitt (1778-1830) was an English essayist, journalist and literary critic. William Macready (1793-1873) made his debut on the London stage on 16 September 1816 at Covent Garden in Ambrose Philips‘ The Distrest Mother, a translation of Jean Racine‘s Andromaque. 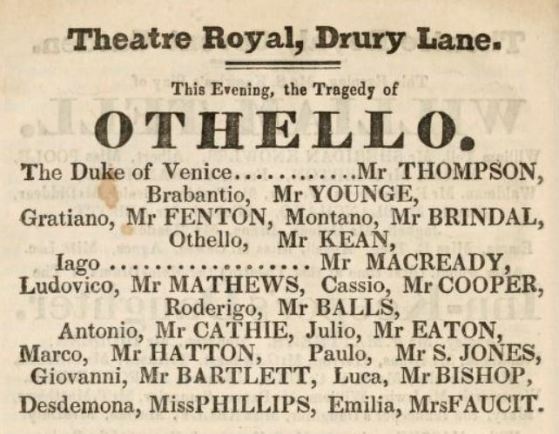 Macready played Orestes, alongside Charles Kemble and William Abbot. Text: I left the Tombs that evening in company with Justice McGrath, and arrived at the Astor Theatre about 7 o’clock; soon after the doors were opened, the audience were assembling; on entering the house, I found the theatre filled with people and a large body of the police; most of the police magistrates were there; Judge Edmonds was there also; the understanding with the magistrates, Judge Edmonds, and the Chief of Police, and Recorder, was that no arrests should be made in the house, unless some overt act was committed, tending absolutely to a breach of the peace; the usual indulgence was to be allowed as to the hissing and applauding; that rule was observed. In the course of the evening, demonstrations were made by several in the parquette, by shaking their fists at Macready, threatening him with violence, by twelve or fifteen persons, certainly not to exceed twenty; an application was made at this time to the Chief of Police to arrest them, and remove them from the house; he delayed the order for some time, and finally sent for the Recorder to consult with him on the propriety of making arrests; after a consultation, it was concluded to make the arrests, which was done; in less than five minutes they were taken into custody, and order comparatively restored; about this time a great deal of hissing was heard in the amphitheatre, and loud applauding; the play was still going on; several arrests were made in the amphitheatre, by order of the Chief of Police and Recorder; about this time, the first breach of peace on the house was a large paving stone which came through the window into the house; the house continued to be assailed from those without; an alarm was given that a fire was below under the dress circle; it was soon extinguished; large stones were thrown at the doors on Eighth street, smashing in the panels, and doing other damage; the police were ordered into Eighth street, say fifteen men; on my going into the street, I saw a large concourse of people, but those near the door of the theatre were mostly boys, who were apparently throwing stones; several of them were arrested by the police and brought in; I cannot say how many were aiding in the disturbance, but certainly a very small proportion to the crowd collected; the policemen arrested some six or ten of them, and the attack on the door in Eighth street ceased; the attack then, after these arrests, was made with more violence on the front of the theatre in Astor-place; a very large crowd was collected, yet I could pass in and out with ease, comparatively; this crowd did not appear to be very turbulent; a very large number appeared to be citizens looking on, and not aiding in the disturbance; the majority of those throwing stones were boys from the ages of 12 to 18 years; several of the policemen at this time complained of being struck with stones and badly hurt; the policemen kept making arrests, and bringing them in; I cannot say how many; the crowd appeared to be increasing and more dense; the mob appeared to be determined to accomplish some particular act; there seemed to be a strong determination, although they only threw stones; the force of policemen on Astor-place amounted to from fifty to seventy-five; the mob then continued to throw stones; the military then came. Comments: Sidney H. Stewart was Clerk of Police in New York City. 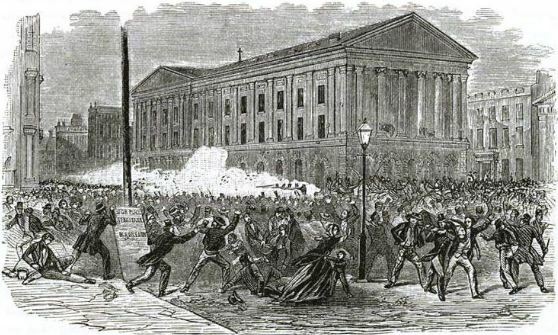 He was one of several witnesses to the riot at the Astor Place Opera House on 10 May 1849 cited in the anonymous pamphlet Account of the terrific and fatal riot at the New-York Astor Place Opera House. The cause of the riot was the rivalry between the American actor Edwin Forrest and the British actor William Charles Macready, which was blown up by the press during Macready’s 1848-40 tour of the United States, cast in Britain vs. America terms. A performance of Macready’s Macbeth at the Astor Place in New York on 7 May 1849 was halted after rioting in the theatre. On 10 May another performance was interrupted by rioting among rival supporters of the two actors which spilled out into the streets. The New York State Militia was called, and at least twenty-two people were shot dead, with dozens more injured. I am a sexagenarian who used to go much to the Princess’s some five-and-thirty years ago, when Macready had an engagement there. I remember it as if it were yesterday. In spite of his faults and his mannerism, Macready brought to his work so much intellect, study, energy, and power, that one admired him when he was living, and remembers him now he is dead. During the engagement I speak of, Macready acted, I think, all his great Shaksperian [sic] parts. But he was ill-supported, the house was shabby and dingy, and by no means full; there was something melancholy about the whole thing. You had before you great pieces and a powerful actor; but the theater needs the glow of public and popular interest to brighten it, and in England the theater was at that time not in fashion. After an absence of many years I found myself at the Princess’s again. The piece was The Silver King. Perhaps I ought to have gone to see The Lights o’ London; but the lyric of Mr. Sims with which the streets were placarded in order to charm us to The Lights o’ London, had to my aged mind, an unpleasant touch of le faux – that danger, as the critic tells us, of the romantic artist:- ‘Comme chaque genre de composition a son écueil particulier, celui du genre romanesque, c’est le faux.’ At any rate I resisted the charm of Mr. Sims, and stayed away from The Lights o’ London. But The Silver King I have just now been to see, and I should like to record some of my impressions from it while they are fresh. It was another world from the old Princess’s of my remembrance. The theater itself was renewed and transformed; instead of shabby and dingy, it had become decorated and brilliant. But the real revival was not in the paint and gilding, it was in the presence of the public. The public was there; not alone the old, peculiar public of the pit and gallery, but with a certain number of the rich and refined in the boxes and stalls, and with whole, solid classes of English society conspicuous by their absence. No, it was a representative public, furnisht [sic] from all classes, and showing that English society at large had now taken to the theater. Equally new was the high general level of the acting. Instead of the company with a single powerful and intelligent performer, with two or three middling ones, and the rest moping and mowing in what was not to be called English but rather stagese, here was a whole company of actors, able to speak English, playing intelligently, supporting one another effectively. Mr. Wilson Barrett, as Wilfred Denver, is so excellent that his primacy cannot be doubted. Next after him, so far as the piece now acting is concerned, I should be inclined to put Mr. Charles Coote, as Henry Corkett. But it is the great merit of the piece that the whole is so effective, and that one is little disposed to make distinctions between the several actors, all of them do their work so well. And the piece itself! It is not Shakspeare [sic], it is melodrama. I have seen it praised as tho it were not melodrama, not sensational drama at all, but drama of a new and superior kind, bordering upon poetic drama, and even passing into it. With this praise I cannot quite agree. The essential difference between melodrama and poetic drama is that one relies for its main effect upon an inner drama of thought and passion, the other upon an outer drama of, as the phrase is, sensational incidents. The Silver King relies for its main effect upon an outer drama of sensational incidents, and so far is clearly melodrama, transpontine melodrama. But for this outer drama, no less than for the inner drama which we have opposed to it, there is needed an exposition by means of words and sentiments; and in the exposition of the melodrama of Messrs. Jones and Herman, there is nothing transpontine. The critics are right, therefore, in thinking that in this work they have something new and highly praiseworthy, though it is not exactly what they suppose. They have a sensational drama in which the diction and sentiments do not overstep the modesty of nature. In general, in drama of this kind, the diction and sentiments, like the incidents, are extravagant, impossible, transpontine; here they are not. This is a very great merit, a very great advantage. The imagination can lend itself to almost any incidents, however violent; but good taste will always revolt against transpontine diction and sentiments. Instead of giving to their audience transpontine diction and sentiments, Messrs. Jones and Herman give them literature. Faults there are in The Silver King; Denver’s drunkenness is made too much of, his dream is superfluous, the peasantry are a little tiresome, Denver’s triumphant exit from Black Brake Wharf puzzles us. But in general throughout the piece the diction and sentiments are natural, they have sobriety and propriety, they are literature. It is an excellent and hopeful sign to find playwrights capable of writing in this style, actors capable of rendering it, a public capable of enjoying it. Another excellent sign should be noticed too. As everybody was said to know how the city of the Ephesians was a worshipper of the great goddess Diana, so may we say that everybody knows that, if not the city of the French, yet their modern drama, like their lighter newspapers, their novels, and their art in general, is a worshipper of the great goddess Lubricity. We imitate and adapt French pieces, and whether the adapter wishes it or not, some traces of the goddess can hardly fail to pass into his work. It is refreshing to find a native piece without the vestige of an appeal to her; and to find this piece, too, admirably given by the actors, passionately enjoyed by the audience. So at least it seems to your obedient servant. Comments: Matthew Arnold (1822-1888) was an English poet, critic and essayist. His ‘Letters of an Old Playgoer’ is five short essay-reviews written 1882-1884 for The Pall Mall Gazette. Henry Arthur Jones and Henry Herman‘s The Silver King was a hugely successful melodrama, which opened at the Princess’s Theatre on 16 November 1882 and ran for a year. Actor-manager Wilson Barrett became particularly associated with melodramas, including The Lights o’ London and The Silver King.